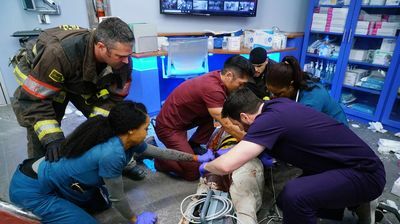 When a car unexpectedly smashes through the ambulance bay doors, Dr. Choi makes some difficult decisions in an effort to save a worker trapped beneath the wreckage and April, who's also in danger. Dr. Rhodes and Dr. Bekker tend to a patient whose best chance at survival is an extremely risky heart surgery. Dr. Charles struggles to come to terms with ex-wife Caroline's treatment.